Yesterday I had to take my mom-mobile into Goodyear to get a tire repaired (somewhere around here is a screw-lined street, because this is the third or fourth one our cars have picked up in the past few months). After waiting a half hour the technician told me that the tire was unrepairable (he said the screw was too close to a patch they'd done previously) and that the other tires on the car were close to failing a state inspection -- so (surprise! surprise!) he recommended we get a new set of tires. He told me they were putting the spare on the car so that I could go home and talk to my husband about what we wanted to do. Because, you know, I am obviously incapable of making a decision about what to do with the car. OK, so I would've wanted to talk to Brad either way about the car, but the technician could've at least asked me -- the driver of the vehicle -- what I wanted them to do before putting the spare on and sending me on my way. If Brad had come in, would he have told him that he should go home and discuss the options with his wife? Brad says that since having the girls I might be a little more sensitive to sexism then I was before**. And I admit, these days I do feel more tuned into the gender wars. But I'm also guarded about talking about it too much because I feel like once a woman starts pointing out disparities, she's labeled a femi-nazi*, which then allows people to ignore anything else that comes out of her mouth. "For the last month now I have been reading letters from people that think Obama should be re-elected and why. There were four letters that I have in mind, and they were from women, Vita Licari, Betty Healy, Judy Weaver and Cara Achterberg -- a so-called community columnist. I would like very much to know what planet these four women have been living on for the last 3 1/2 years. Under the Obama administration we have 23 million people unemployed, he has us $16 trillion in debt, we have a $4 trillion deficit, and household income, under his administration, has fallen more than $4,000 -- and yet these women think that he should be given another four years. 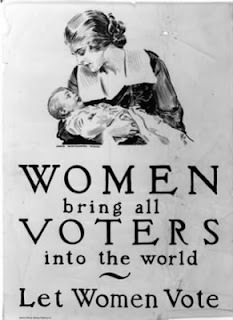 It makes a person stop and think that maybe giving the women the right to vote might have been the wrong thing to do." The sad part about the writer's conclusion is how not shocking it is. When everyone is having to shout to make their point, they feel compelled to add little gems like revoking the 19th amendment in order to get people to listen. And because the bar has been lowered so much and so often, this one-upsmanship has almost become an accepted and expected form of discourse in our society. But it's meaningless. And it distracts from any legitimate point the writer or speaker or blogger or whoever might have been trying to make. The only thing I took away from this letter is that the writer is a crazy bigot. And I'm not inclined to take advice on voting from crazy bigots. Oh, and since I know you were on the edge of your seat about the car (did she buy a full set of new tires? Did she fashion a patch for the flat using gum and Play-Doh? Did she march back into Goodyear full of righteous indignation and give them a piece of her mind?) I took it to Sears. They repaired the flat for 20 bucks. *If I ever get around to writing that critique of female characters in "101 Dalmatians" then I'll really sound like a raging feminist. There's another cliche that should be banned. You know how Google finishes your search terms when you start typing something in the search bar? Raging feminists fills itself out. The word "raging" is so loaded -- it also allows people to dismiss whatever the "rager" might have to say. And you'll never see the phrase "raging masculanist" (or whatever the male equivalent is) because these days being unapologetically manly is endearing. 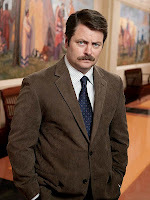 Just look at Ron Swanson and the return of the mustache. For the record, I love Ron Swanson. Not so much the mustaches. Anyway, every time Perdita says "Oh Pongo, what'll we do?" I want to rip my ears off. So, if you ever hear a story about an earless raging feminist. You'll know what went down. ** For the record Brad was completely sympathetic about the Goodyear incident. I think I was born at the wrong time in some ways - I'm so NOT concerned about gender rights that it can only be because I was brought up in a world where, for me, my gender was never an issue. Thankfully, that's the way Sarah is about race - she has no understanding of why people get hung up about it, because in her life, among her circle of friends, it's never been an issue. Not just that she's got a diverse group of friends, which she does, but they don't even NOTICE their diversity, or worry about it, it's that ingrained and assumed. Joan - that's so wonderful for Sarah. I'd love for my girls to have that same perspective on diversity, which is no perspective at all - people are people and that's the end of the story.